If you’re left-handed, you’re probably used to adapting to right-handed items and activities. Only approximately 10 percent of the world’s population is left-handed. In many instances, you’re at an automatic disadvantage. Luckily, golfing is mostly an exception to that rule. There are many seasoned lefties that can dominate the course with no problems. The mechanics of a swing are the same regardless of your dominant hand. The challenge lies in adapting your playing style to a course and game that’s catered to the majority. There are a number of tips that you can use to improve your game technique. Whether you’re an experienced player or a complete novice, these tips will benefit your unique playing style so that you can see better results on the course. One of the most important things you need to do before you hit the green is to invest in high-quality gear that’s designed for your dominant side. It’s not uncommon to see lefties attempt to switch sides for the sake of the game. Truth is, left-handed clubs are harder to come by. Because such a small population of golfers is left-handed, manufacturers only produce these clubs in small quantities. While it may be a hassle, it’s well worth the investment. It’s physically impossible to use a club that’s not made for your dominant side. To do so, you’d have to switch sides and attempt to play like a right-handed golfer. Most people don’t even know how to write with their non-dominant hand let alone play golf. With the right gear, you can face the direction of your swing and use your left leg to stabilize your swing. One of the biggest obstacles for left-handed golfers is that they must use their non-dominant hand to control the clubface. This control must happen at the most crucial part of your swing: the impact. To get the task done efficiently, your non-dominant arm needs to be strong and steady. There are a few different exercises you can perform to gain more power over time. Start by standing in the appropriate swinging stance with a tee on the ground below you. 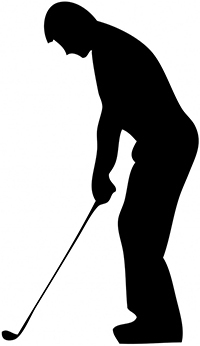 Then, take your dominant left hand off the club and place it behind your back. Raise your right arm holding the club as if you were building up for a swing. When your right arm is parallel to the ground, hold the position for a moment before swinging down to knock the tee out. Keep your right elbow close to your body for further control. This exercise can help you gain strength and control over the club face. To achieve a solid hit, your body needs to move smoothly with your swing. Many left-handed golfers have a problem doing this at first because they’re accustomed to seeing right-handed golfers rotating in the opposite direction. To be successful, you need to turn your upper body fully to the right. Your hip should lead the rotation after you’ve made contact with the ball. To see maximum results, your body should rotate as much as possible until you’re facing your shot. As you’re turning your upper body, follow through with the shot by getting up on the balls of your feel. You should never end a swing with your feet planted firmly on the ground. As mentioned earlier, it’s all about moving your body in one continuous motion. During the rotation, use the balls of your feet to turn even more. The momentum of your arms making the swing should make the move effortless. By turning with your upper body and feet, you can utilize as much power as you have to make your shot. With practice, this can result in a higher loft and more distance. Doglegs refer to a bend in the fairway of individual holes. They’re not a straight shot and require great technique to overcome. Most dogleg holes veer from the left to the right. This can pose a significant problem for left-handed players because of their natural address position. The best way to get through a dogleg hole is with a draw shot. Draw shots cause the ball to curve in one direction. To be successful, you need to manipulate the ball so that it follows the particular curve of the fairway. For left-hand players. the ball would need to turn to the right. To achieve this, the ball must be hit with a unique swing path. Not only that, but the face also has to be slightly open to the target where you want the ball to go. It’s a tricky shot that requires plenty of practice. However, mastering it can provide you with a noticeable advantage on the course. It’s very tempting to lift your head while you swing. It’s a natural reaction to want to see the trajectory of the golf ball. However, this can completely throw off your swing and follow up. Moving your head compromises that rotation you’ve worked so hard to achieve. Not only are you changing the weight distribution throughout your body, but looking upwards towards the sky will pull focus from your rotation and arm movements. Your head should remain down during the full course of the swing. Your eye should remain on the ball to ensure that the club face is properly positioned. It’s only after you complete your follow through that you can see how your shot went. Being left-handed doesn’t mean that you have to sacrifice your technique. You’re used to adapting to a right-handed world, so why not do the same with golf? With a bit of extra practice, you can master your technique and use your unique playing style to your advantage.